I’m starting off 2014 with what I believe is a pretty exceptional rarity. Certainly it’s one of the earliest commercial recordings of regional music from the highlands of Western Sumatra made by the Minangkabau people, known as Urang Minang in the local language. With most of the local recording industry at the time based in Java and Singapore, we are lucky that music of the Minang, a matrilineal, Islamic culture primarily based in the Minangkabau Highlands, was set to shellac. But more on that in a moment. Traditional music practiced by the Minangkabau, or the “People of the Plains,” is varied – there are classical songs for the bamboo flute (saluang), gong and drum ensembles (talempong) and numerous other types, and the music varies from the highlands to the coast. This track features the one-stringed rebab fiddle, the saluang flute, and the puput or pupuik, a rice-stalk reed instrument. There are three main styles of Sumatran rebab music: rebab pasisie, rebab piaman, and rebab darek. The first two are music of the coast, and the latter is inland rebab music. While I’m not certain which style this is, it’s a lovely example of a kind of insistent and droning nature of Minangkabau music, with ornamented playing by the saluang and puput (one of which is very much in the distance), augmenting the string. For the sake of documentation, I retained the original spelling on the label, though the Indonesian alphabet’s spelling system was changed in 1947, following independence. The female singer, “Rapioen,” would today be spelled “Rapiun.” The title of the piece “Tandjoeng Sani” would be spelled “Tanjung Sani,” which refers to a small village of the same name in Western Sumatra. The label also lists “Boekit Tinggi,” which is the archaic spelling of the small city of Bukittinggi, formerly known as Fort de Kock, and where the musicians hailed from. “Djirek” in parentheses is the name of the 3-instrument ensemble – “Jirek” in today’s spelling. This piece was recorded in May 1939 by the Tjap Angsa (meaning “Swan Brand”) label – it was recorded during their second recording session. According to the research by ethnomusicologist Philip Yampolsky, Tjap Angsa recorded most or all of their material in the city of Medan on the northern Sumatran coast, where they were partially based (their other headquarters was Bukittinggi). The label began in 1938 and issued several hundred discs, repressing some of them into the late 1940s. This disc was pressed in China, by the Chinese branch of EMI, who also supplied the engineers for the recording session. While it would make sense for a Sumatran-based 78 label to record local musics such as those by the Minangkabau, other multinational labels did as well, for local distribution, including HMV, Columbia, and Odeon. Today, the Minang are a thriving culture of over 6 million with a very popular music scene (pop Minang is the name of the current genre). I don’t want readers to exoticize this music to the point that they think the musicians must live in mud huts. 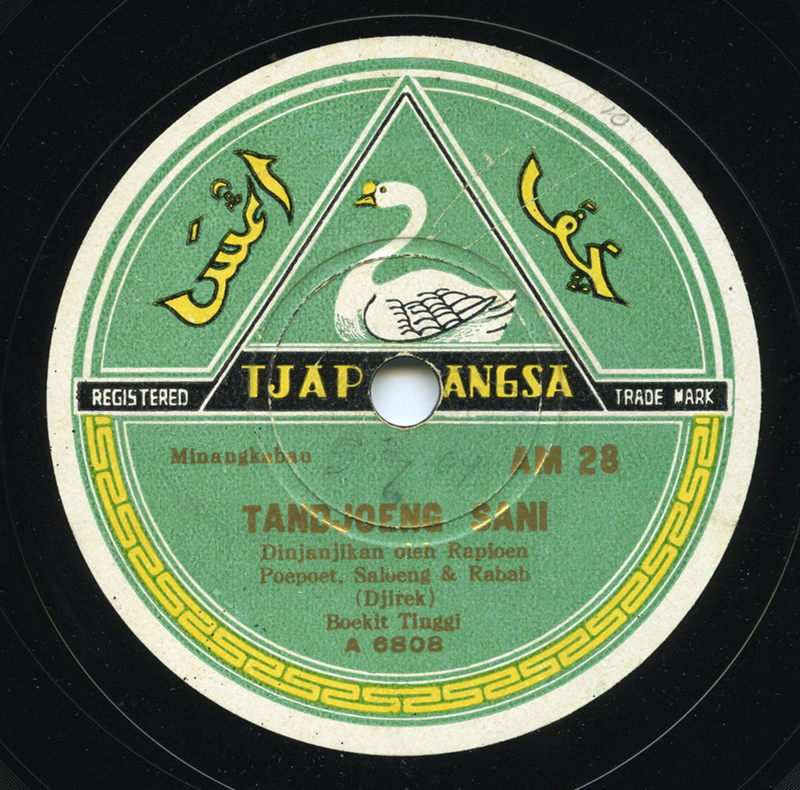 That said, Minangkabau music constituted a definitively minor percentage of 78rpm releases when compared to the thousands of krontjong discs released, as well as other popular and traditional styles from the region. Today, in fact most all 78s from Southeast Asia are scarce, no matter what style you’re talking about – even the full-fledged Western-style pop. I don’t think that’s going to change anytime soon – the tropics substantially increase the 78rpm attrition rate. And this seems like the perfect time to bring up the recent release Longing For the Past: The 78 rpm Era in Southeast Asia, compiled and edited by my friend David Murray and recently issued on Dust-to-Digital. I’ve only mentioned it on the ES Facebook page, but I should state that it’s one of the best looking and best sounding archival releases ever produced. I am biased – I provided some of my favorite rare Southeast Asian discs from my collection and did the transfers – but Dave, D-2-D and crew put an extraordinary amount of effort in that release. If you are interested in Southeast Asian music, you will truly appreciate it. This post would just be a handful of sentences were it not for the published research of, and my correspondence with, Philip Yampolsky, as well as correspondence with Indonesian music historian Alfred Ticoalu.